We all love to imagine that we eat healthy. Some of us actually even do it! But one thing we love more than actually eating right, is talking about eating right. The internet is flush with millions of how-to guides and recipe collections on the subject. The problem is simplicity. We’d love to eat better, but putting in the effort can be so hard. To solve this dilemma, we’ve gathered a handful of quick and easy visual guides for eating better. They’re fast, fun, and most importantly, easy! Servings are hard enough to gauge when you’re pouring something out of a box, but how do you know when enough is enough when dealing with nature’s ready-made snacks? This little breakdown will show you exactly how many of any given fruit you should eat. Every field has its experts, and eating is no exception. Nutritionists tend to know more than the average Joe about what’s best to put in your stomach, come dinner time. 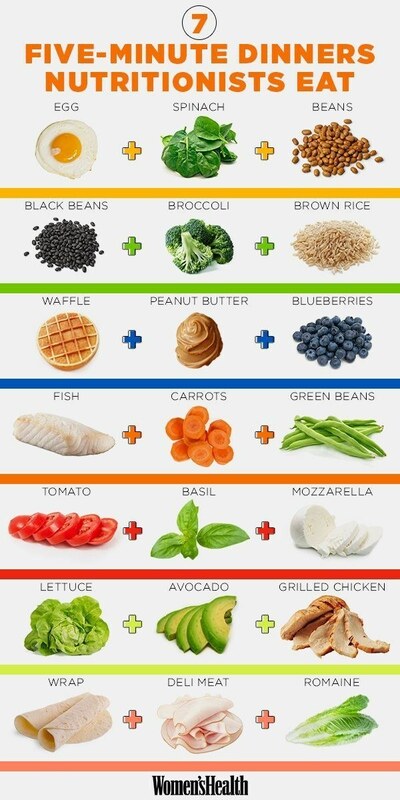 These are supposedly their go-to choices, each defined by three ingredients: your choice to mix and match! Paleo is one of the most popular diet trends, but unlike veganism or going gluten free, it can’t be defined in one sentence. 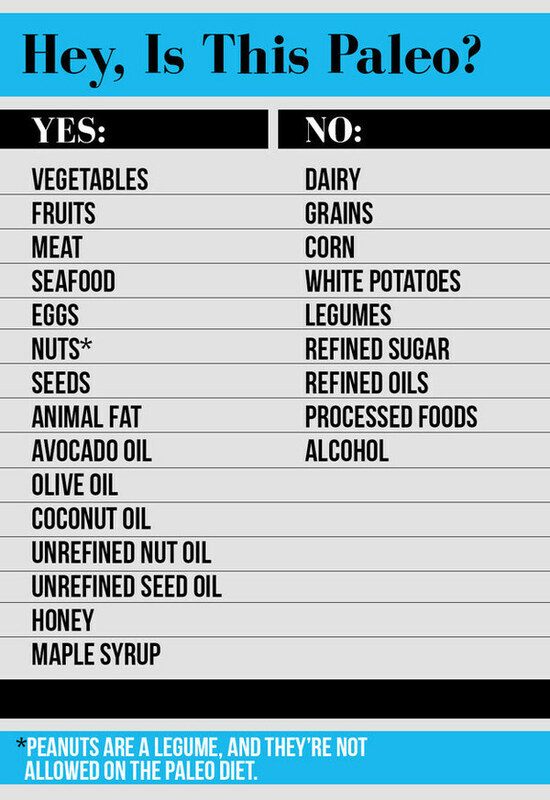 This handy chart breaks down what foods are and are not considered paleo, with a specific note about the most popular nut, the peanut, because it is actually a legume. Who knew?? We can fondle and squeeze all we want, but figuring out the best time to eat an avocado has a super simple solution. As the picture shows, you simply remove the stem plug and check the color beneath. Now you’ll never have to cut one open only to realize it should have spent a little more time on the windowsill. 5. 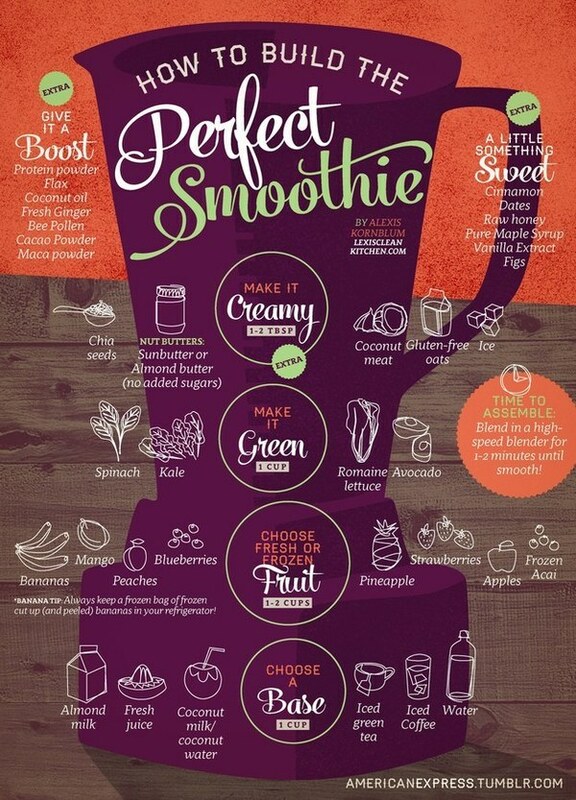 The Only Smoothie You’ll Ever Need? With an easy to understand process, plus a couple optional extras, this quick and handy guide will have you slamming healthy, hearty, and extremely tasty beverages in no time. The best part is that it’s focused on healthy ingredients and natural sweeteners, avoiding the kind of junk you get from store-bought smoothies. It’s true. It’s healthy. It tastes amazing! This infographic drops some serious knowledge, with 25 diverse recipes for everyone’s favorite (non-alcoholic) liquid snack. These recipes are perfect for anyone who normally skips breakfast, or anyone looking for a post-workout snack that doesn’t come from a jar with bulging muscles on the label. Bonus points: drinking an avocado feels awesome. 7. Make This Perfect Portable Salad! 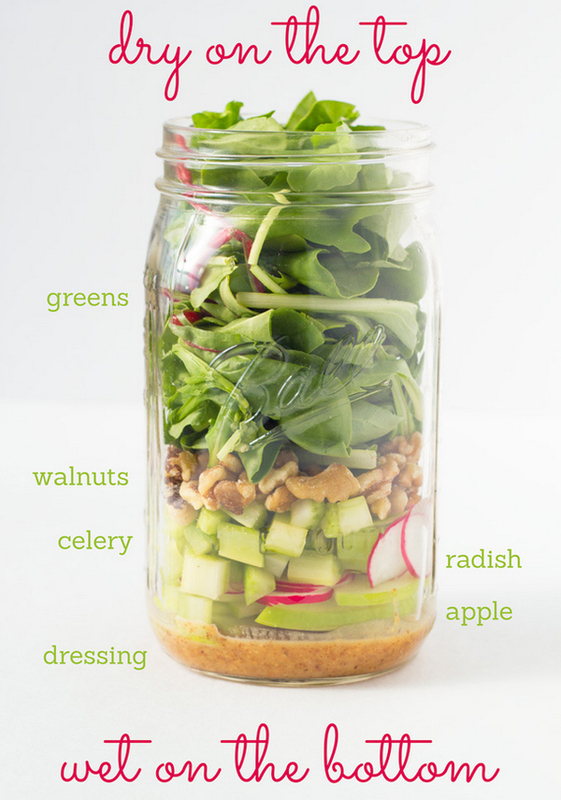 In one large sized Ball jar, you can pack a densely nutritious and delicious salad that will satisfy your lunch cravings on long days at the office. We’d say that the best part is how portable this meal is, but we think the taste is even better. Let’s face it: most folks simply drop the tea bag in hot water and let it sit forever, maybe removing it once they’re near the bottom of the mug. But you can actually steep your tea too long! 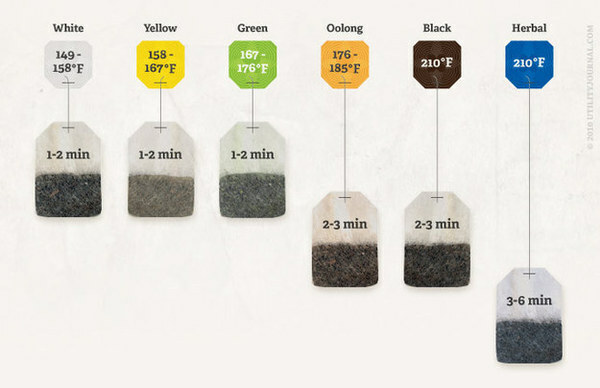 This handy visual guide shows both the best temperature for different teas (we didn’t even know that was a thing) and the amount of time they should steep. It’s fun realizing that we’ve been doing it wrong for years! Most of us hold fond memories of growing up with mom’s homemade soup boiling in a large pot on the stove. The smell fills the house, the soup fills your stomach, and the leftovers fill the fridge for days. Now you can do the same in a few simple steps! Despite its reputation as a healthy choice, salads are often nutritionally ruined by a dollop of fatty, salty store-bought dressing. 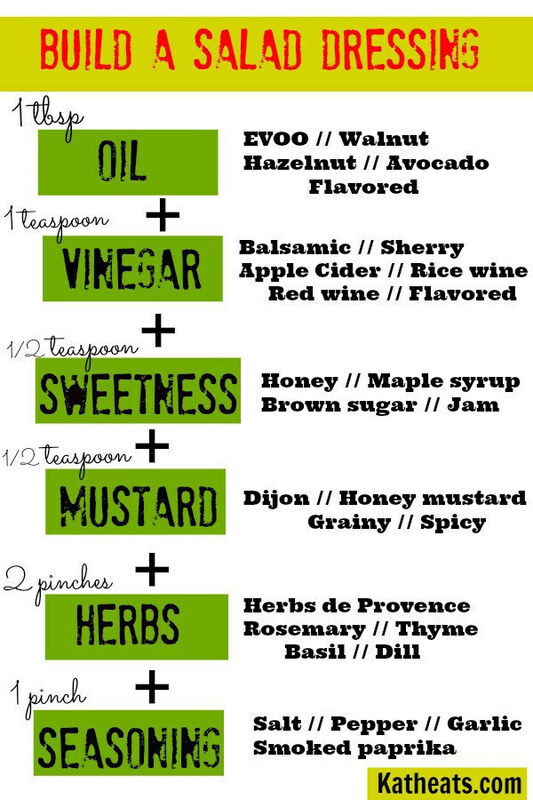 This little chart lays out several combinations of dressings you can make in your own kitchen, without all the excess junk. Living on your own, it can be hard to do actual grownup shopping. What’s easier than throwing a box of Hot Pockets in the freezer and calling it a day? 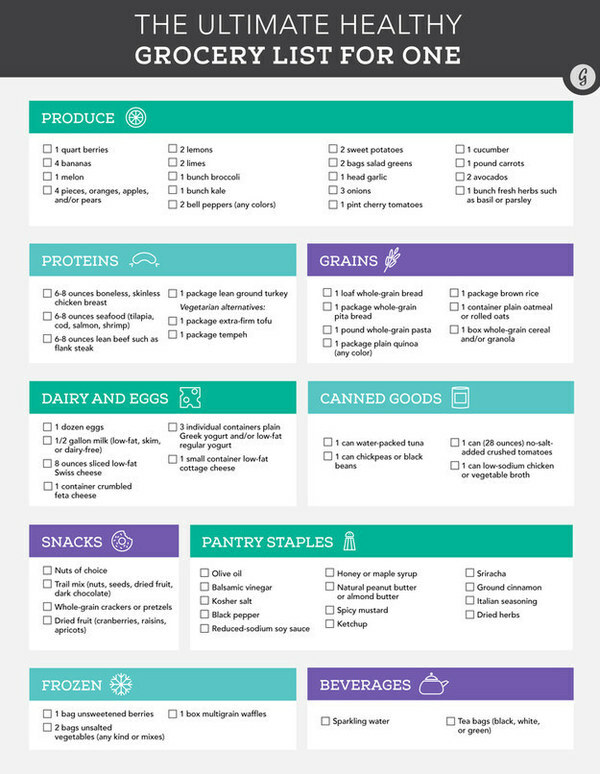 The list below can help steer you toward healthy, well rounded choices with ease, navigating the wilds of your local grocery store like a seasoned pro. Here’s a crazy easy guide to cooking them right! A well rounded diet includes grains like rice and quinoa, foods you can’t exactly buy readymade. With a little push and some sound advice, you too can start eating like a healthy adult!